This is the time of year that getting organized is especially on everyone’s mind. The busy-ness and craziness of the holidays are coming to a close, and when the tree goes down, the urge to organize everything hits in full force. Sometimes though, it can feel SO overwhelming, looking at a room, or a drawer, or a closet, (or all of the above), and wondering where in the world to even start. You know you want to, you know you need to, but now what? How exactly do you make that leap, and get started? 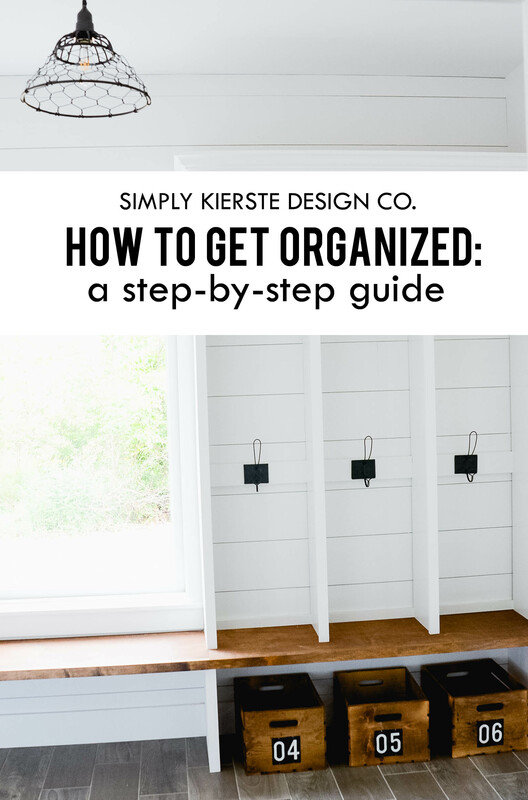 I’m sharing my tips and tricks that will help you know HOW to get organized. YOU can do this…one step at a time! Remember…the goal of getting organized isn’t getting everything perfectly lined up in a row, it’s making it work for YOU. How you organize something will be different than someone else, and that’s okay…it’s how it should be! Setting a goal is probably the most important step of all. Print off a monthly calendar or buy a cheap one, and set dates for when you are going to accomplish each item on your list. It’s vital to put a timeframe on each item, so you are working toward something with a deadline. Make it reasonable, but not excessive. I’ve seen some charts around that have an item per week, if that works for you. I prefer to set my own, because some things will be quick, and only take a day, and others (like organizing your recipes) might take a couple of weeks. You can also take into consideration which things are the most important, which need to go first, plus you can avoid scheduling on weeks you will be out-of-town, or extra busy. Not sure how long it will take? Give it your best estimate, and then work hard to stick to that. 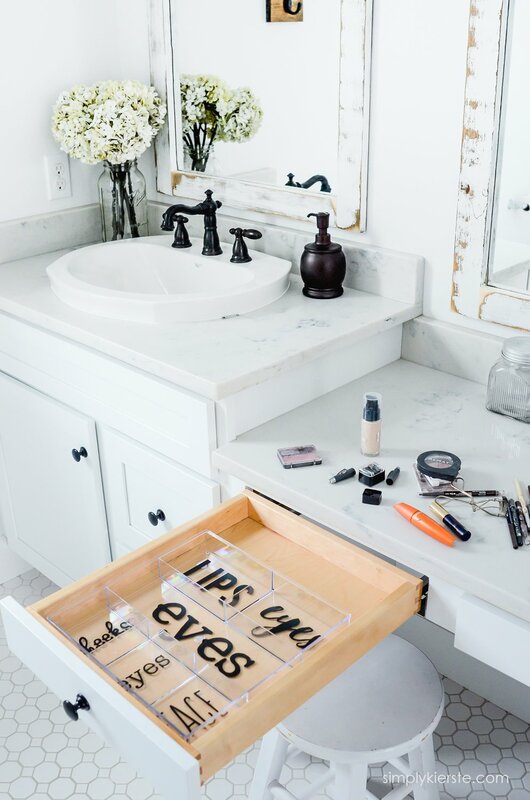 This is another reason that being specific helps–it’s much easier to gage how long it will take to clean out your makeup drawer, then trying to gage how long it will take to organize your entire bathroom and closet. 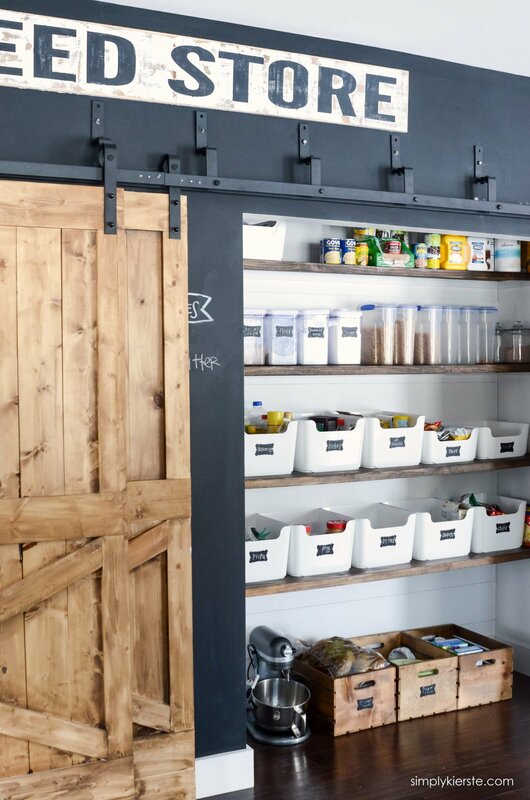 Be realistic–giving yourself one day to undertake a massive project like organizing your entire food storage might not be reasonable, but it could be, depending on your schedule. Some of these tasks could take a day, an hour, a few days, or a week. Several of these could be combined in a week, and others might take that amount of time on their own. THIS WILL NOT HAPPEN OVERNIGHT, and you shouldn’t expect it to or try to. I understand–I’m totally impatient, and once I decide to go for something, I try to do it as fast as I can. But to get really and truly organized, you need to do it the right way, and spreading it out over at least 6 months is probably the best way to do it so you don’t get overwhelmed or burned out. As far as the order goes, and which items you take first, you can do a couple of things–by room, or by type. I like to do it by room–for example, if I’m doing the kitchen, I would work down my kitchen list before moving on to the next room. You can also do it by type, if you prefer that. For example, do all the closets in each room, then clean under all the beds in each room, then clean out all the dresser drawers in each room, etc., before moving on to the next item on the list.This can be helpful if you know you’re going to have a lot of like items to get rid of, and you want to be able to do it all at the same time. This might sound funny, but I’ve found that when I’m tackling any kind of big project, I need to have my head in the game, and ready for what’s ahead. It might be a lot of work, and take some time, but getting organized will help so many other aspects of your life. If you are feeling totally overwhelmed, because you feel like there is just too much to do, I have faith in you. You can do this! Take small, baby steps. Tackle one small project at a time, and when you see progress being made, it will feel so good! All the work, will be worth it. So…you’re ready to start! You’ve made your list, and on your ready for your first project! Most of the jobs on your list to be tackled will need to involve sorting–keeping, throwing out, giving away. WHAT DO I KEEP? WHAT DO I GET RID OF? 1. How long has it been since I’ve used it? 2. Do I see a need for it in the next one year? 3. Why am I saving it? 4. Can someone else use it or benefit from it? 5. Do I have room for it? 6. Do I LOVE LOVE LOVE it? Answer them honestly, and they will help you know what to throw out and what to keep. You might have a tendency to want to keep EVERYTHING, but it’s very unlikely that there’s nothing that needs to go. Clothes are grown out of, children grow up and don’t use toys anymore, and “stuff” is just accumulated. If it’s been more than a year since you’ve worn something, you’re probably not going to wear it again. I can look in my closet right now, and see several shirts that I think I’m going to wear and love, but I never do. And I most likely won’t. Why are they taking up space in my closet? So…they’re going out. There are a few exceptions to the rule: maternity clothes, children’s clothes you’re saving for the next ones in line, items that are only used once a year, toys and games you’re saving for the next generation, and maybe one pair of “skinny jeans” and “fat pants”. :) Even then, when you’re keeping maternity clothes: Did you wear it the first time around? If you didn’t (and not because of the season), then you won’t the next time. And children’s clothes: Are they in good repair? How often did you have them wear it? If it still has the tags on it, or it sat in the closet or drawer the whole time, odds are, you will not use it again. Are they trendy items that will totally be out of style by the next time you use them? Keep, Discard, Donate, and Sell (optional). When I lived in Michigan, I had an annual garage sale with my bestie, and it was SO fun. We talked all day, got rid of stuff, and made a little extra money. It’s something to consider, but not necessary. Donations to Salvation Army, Goodwill, Deseret Industries, etc., are always appreciated if the items are in good repair. Don’t forget to get a receipt, because your donations are tax-deductible. There are always items that just need to be thrown away or shredded–old papers, broken toys, ripped or torn clothes that can’t be fixed, games that are missing most of the pieces, etc. Finally…the box to keep. Make sure you really need it, love it so much you might die without it, or use it in the next year! As you sort, place items in each appropriate box. When you’re finished, make sure you take care of the other boxes right away–to the trash, or to Goodwill. Only keep boxes “to sell” if you know you’re really going to have a garage sale, and hopefully it’s not too far down the line. Otherwise, you’ll just have another stack of boxes to deal with. When you’re organizing a space, keep in mind how you’re going to use it–what’s most important there? For example, in your kitchen: Where does it make the most sense to have your utensils? Do you need more room for your spices? What needs to be front and center in the pantry? What can be moved to the attic/basement because it’s not used very often, leaving more space for something else? Really examine what will work the best for you, before you make any changes. You’ve got things sorted…now what? My mantra in my home is “A place for everything, and everything in its place”. I live by it, and it makes ALL the difference. You can’t stay organized if there isn’t a place for everything, and it is THE KEY to success. Everything in your home needs a place to be–a dedicated place where it is when it’s not being used, and where it goes back to when you’re finished using it. You don’t need to spend a lot of money, but you will probably need to spend some. I use plastic drawer organizers everywhere in my house…in the kitchen for utensils, in the bathroom, in linen closets, under sinks and cabinets, in desk drawers, everywhere! I also use other types of baskets and storage to help keep everything in its place. Walmart and The Dollar Store are great places to look if you don’t want to spend a lot of money. If you have an IKEA nearby, they also have some great organization items for pretty reasonable prices. 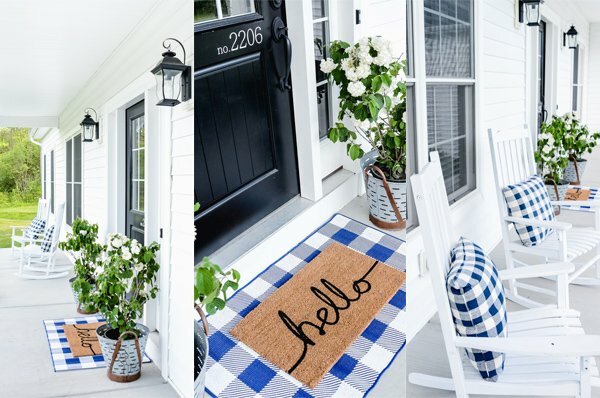 You can check out Target, Marshalls, TJ Maxx, Home Goods, and even places like Crate and Barrel and Pottery Barn Kids if you have a little more money to spend. Labels are always a good way to help stay organized. You can search online for free printables, or create your own in Word and print onto address or shipping labels. They work great on the outside of storage tubs, for things like camping and holiday boxes. Your space will also help you determine how much you can keep, and how you have to store it. We are living in a small apartment right now while our house is being built, and with eight people in that space, it leaves very little room for “stuff”. I’ve had to completely change the way I organized our things, but I was able to fit clothes and shoes for four children in one small walk-in closet. Crates are stacked along one side of the wall three high, and three wide, and they are acting as a dresser for my girls. (No room for a dresser in the room…it’s full of beds. :) ) Baskets for shoes–one for each of them) is along the other side of the wall. The rod along the back of the closet has one of the hanging dividers that contains my boys’ clothes, and the rest of the rod space is all the hanging clothes for all four of them. I made it work using inexpensive storage items–a cost of less than $75 for all of it. Ive never really bought a ton of clothes for my kids–I have a certain amount that they need, and that I aim for, but this made me realize how much they actually do need. We do have about 90% of our things in storage, and I’ve realized what I miss–and what I don’t. I will be doing a lot more cleaning out before we move in! If you have a small space too, it’s totally possible to get organized. Consider organizing “up” instead of “out”. Stack crates that you’ve painted or stained and use them as bookshelves, a dresser, a linen closet in a bathroom that doesn’t have one, in the kitchen for pots and pans, or in the playroom for toys. Taller bookcases can do the same thing–also great for placing organizing baskets. Utilize all your space–in a small closet, use the shelves above (you can add them if you need to), the hanging rod, and the space below. Instead of lining items up at the bottom of your closet, use stacked crates, or a cubby shelf to fit even more in. All that space is valuable under hanging clothes, especially when you don’t have a lot to begin with. UPDATE: I’ve moved since I first posted this, but now I can show you how you can have an organized pantry whether it’s small like this one, or larger like the one I have now. I’ve lived with all sizes of homes and storage spaces, and it’s possible in all of them! 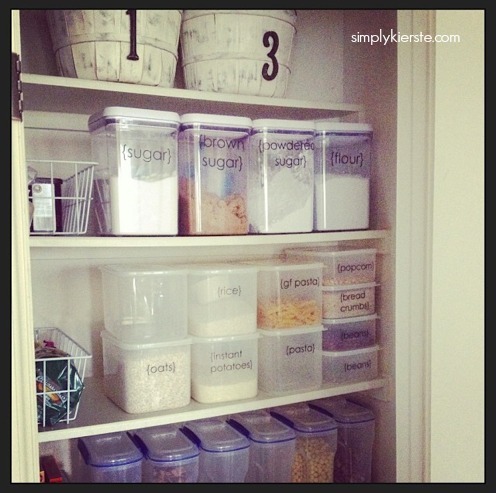 I used lots of containers to organize my pantry. I bought the wire ones at Walmart (they are actually freezer containers, but they work perfectly! ), and the others from The Container Store. I’ve seen similar items at Walmart and Target. I don’t use printable labels, because then I can’t wash the containers, which is important to me. I use vinyl, because I can wash them—I’ve even sent them through the dishwasher with no problems! Think outside the box when it comes to containers! 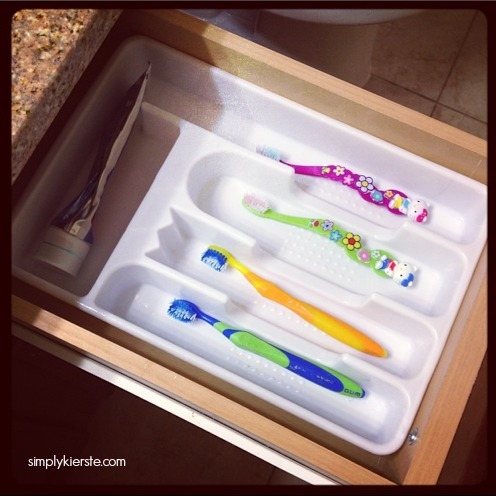 I love using plastic silverware trays for toothbrushes, because they are so easy to keep clean! Just rinse them out regularly. 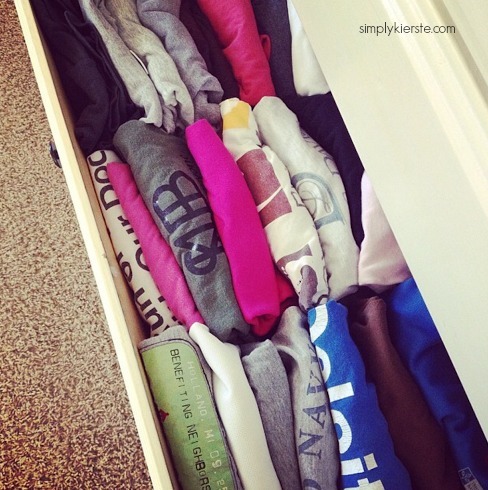 I fold tee shirts like the to go in dresser drawers…I can fit so many more in there!! I organized the garage using inexpensive baskets from the dollar store, and it makes a huge difference! I have a whole compilation of specific organization posts that will help too! Maintenance is necessary, but if you do it on a regular basis, it won’t take nearly as long. I try and keep to an annual schedule–cleaning out clothes at the end of each season, cleaning out toys right before Christmas, organizing food storage in the spring and winter, and a regular clean out of papers. I actually write it on my calendar and to-do lists, so I don’t forget, and have it in my mind that it needs to be done. It’s amazing how much “stuff” we can all accumulate over any particular time period, so it’s important to regularly analyze what can be removed. You are going to be doing all of these projects over a matter of time, so once it’s organized, keep it that way! YOU CAN DO THIS!!! This is YOUR year to get organized! This is an Excel file, so you can open it and edit yours as necessary. You can keep it on your computer, or print it out for the fridge, inside a binder, or wherever works for you! Thank You! !!! This is so helpful, I do get overwhelmed, like most people. I really like the daily sheet knowing I can stay on top of things. Hope you have a Happy & Healthy New Year !!!! Thank you so much for your encoragment and your ideas. I only wish I was as organized as you seem to be. Everything is a complete mess in my home right now. In a few months I will be getting married and moving in with my husband, so I need to follow this advice and get rid of a few things we have in our home. The last thing I want is to start of our marriage in a cluttered home.